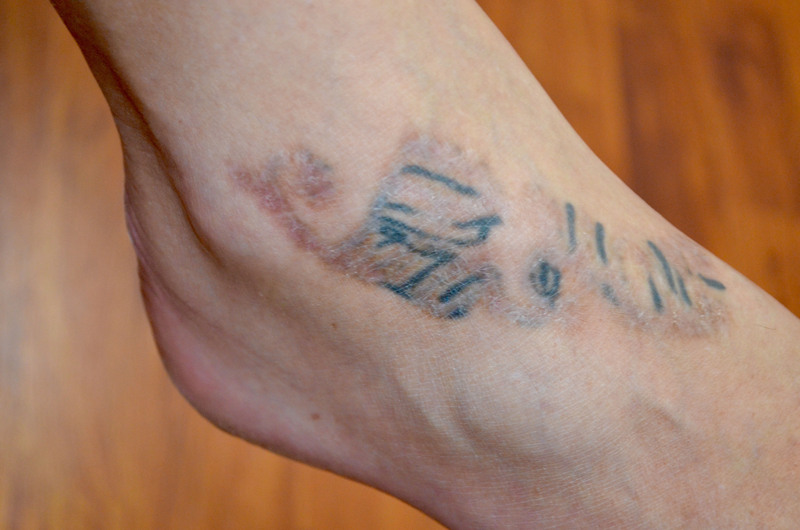 Here is an example of the scars and skin damage caused by two Skinial treatments on the skin of this person’s foot. Skinial and other injectable laser tattoo removal ‘treatments’ work on the principle of injecting or rubbing a chemical cocktail into the skin to cause a chemical reaction to burn and remove the ink. The results are very painful and usually permanent. The scars created by such chemical burns are FAR worse than the tattoo itself. The chemical reaction damages the skin and the dermis that can lead to infections and other major health issues in the affect area. In this case, the scarring has been extensive and quite severe. There is severe hyper-pigmentation leading to a darkening of the skin in the treated area. Instead of rendering the tattoo ‘invisible’, it has created a large dark prominent scar on the top of the foot. Most of the ink of the tattoo is still visible and we are concerned that the ink maybe encased in scar tissue making complete tattoo ink removal impossible even using the Quanta Laser System. Only laser tattoo removal can offer scar-free ink clearance, so please consult with a recognised laser tattoo removal clinic before embarking on your tattoo removal journey. How do you find a recognised clinic? Here is an article from our friends at Tatts-A-Mistake that can help. What may seem cheap and easy tattoo removal may create far more problems than it solves, as is the case here. All the person wanted to do was to remove an old tattoo to improve their professional business appearance. What we are left with is a far more serious problem to overcome. This year is moving along at a cracking pace! Summer doesn’t want to end and the weather here in Sydney is just picture perfect. Maybe that’s why so many more people are having their tattoos removed – the warmer it is, the less clothes people wear and the more ink is on display for the world to see. Whatever it is, at Disappear Ink we see a lot of different tattoos in a lot of different places. They range from the usual bicep tribals to some really weird tattoos in really weird places. Along with all of those tattoos are the wonderful stories of how they came to be and more importantly to us, why people want those tattoos removed. So every year we share the top 10 reasons why people want their tattoos removed and here is Disappear Ink’s Top Ten Reasons For Tattoo Removal 2016.